"Read my lips: no new taxes" is a phrase spoken by then American presidential candidate George H. W. Bush at the 1988 Republican National Convention as he accepted the nomination on August 18. Written by speechwriter Peggy Noonan, the line was the most prominent sound bite from the speech. The pledge not to tax the American people further had been a consistent part of Bush's 1988 election platform, and its prominent inclusion in his speech cemented it in the public consciousness. The impact of the election promise was considerable, and many supporters of Bush believe it helped Bush win the 1988 presidential election. The line later hurt Bush politically. Although he did oppose the creation of new taxes as president, the Democrat-controlled Congress proposed increases of existing taxes as a way to reduce the national budget deficit. Bush negotiated with Congress for a budget that met his pledge, but was unable to make a deal with a Senate and House that was controlled by the opposing Democrats. Bush agreed to a compromise, which increased several existing taxes as part of a 1990 budget agreement. In the 1992 presidential election campaign, Pat Buchanan repeatedly cited the pledge as an example of a broken promise in his unsuccessful challenge to Bush in the Republican primaries. In the general election, Democratic nominee Bill Clinton, running as a moderate, also cited the quotation and questioned Bush's trustworthiness. Bush lost his bid for re-election to Clinton. In 1984, there was some controversy when Bush seemed to diverge somewhat from Ronald Reagan's view on taxation. Responding to Walter Mondale's admission that if he were elected taxes would likely be raised, Bush also implied that tax increases might be necessary in the next four years. Reagan asserted that he had no plans to raise taxes in his second term, and Bush quickly argued that he had been misunderstood. Bush's statements led some conservatives to begin doubting Bush's dedication to tax cuts. As the competition to succeed Reagan began in 1986, it was clear that taxes would be a central issue. Grover Norquist, head of Americans for Tax Reform, had created a no-new-taxes pledge and was encouraging Republican candidates to sign it. A large number of congressional candidates signed, as did Bush's primary rivals Jack Kemp and Pete du Pont. Bush at first refused to sign the pledge, but in 1987 eventually acquiesced. (Norquist still urges politicians to sign his tax pledge and claims that almost 50% of congressmen have taken the pledge). The Bush campaign would later join other candidates in using the tax issue to attack Bob Dole, who had not been clear on the subject. The passage was written by leading speechwriter Peggy Noonan, with Jack Kemp having suggested the basic idea. Including the line caused some controversy, as some Bush advisers felt the language was too strong. The most prominent critic was economic adviser Richard Darman, who crossed the phrase out on an initial draft calling it "stupid and dangerous." Darman was one of the architects of Reagan's 1982 tax increase, and expected to have a major policy role in the Bush White House. He felt that such an absolute pledge would handcuff the administration. Upon the advice of others however, especially Roger Ailes, the line remained in the speech. It was felt the pledge was needed to keep conservative support in a campaign that was trying to be very centrist. It was also hoped it would add an element of toughness to a candidate who was suffering from a perception of being weak and vacillating. At the time Bush was significantly behind Michael Dukakis in the polls, and Darman later argued that the campaign was far more concerned with winning than governing. When in office, Bush found it challenging to keep his promise. 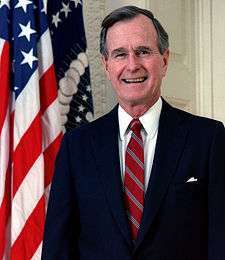 The Bush campaign's figures had been based on the assumption that the high growth of the late 1980s would continue throughout his time in office. Instead, a recession began. By 1990, rising budget deficits, fueled by a growth in mandatory spending and a declining economy, began to greatly increase the federal deficit. The Gramm-Rudman-Hollings Balanced Budget Act mandated that the deficit be reduced, or else mandatory cuts unpalatable to both Republicans and Democrats would be made. Reducing this deficit was a difficult task. New cuts of any substance would have to come either from entitlement programs, such as Medicare or Social Security, or from defense. The budget for the next fiscal year proved far more difficult. Bush initially presented Congress a proposed budget containing steep spending cuts and no new taxes, but congressional Democrats dismissed this out of hand. Negotiations began, but it was clear little progress could be made without a compromise on taxes. Richard Darman, who had been appointed head of the Office of Management and Budget, and White House Chief of Staff John H. Sununu both felt such a compromise was necessary. Other prominent Republicans had also come out in favor of a tax increase, including Gerald Ford, Paul O'Neill, and Lamar Alexander. At the end of June, Bush released a statement stating that "it is clear to me that both the size of the deficit problem and the need for a package that can be enacted require all of the following: entitlement and mandatory program reform, tax revenue increases, growth incentives, discretionary spending reductions, orderly reductions in defense expenditures, and budget process reform." The key element was the reference to "tax revenue increases" now being up for negotiation. An immediate furor followed the release. The headline of the New York Post the next day read "Read my Lips: I Lied." Initially some argued that "tax revenue increases" did not necessarily mean tax increases. For example, he could mean that the government could work to increase taxable income. However, Bush soon confirmed that tax increases were on the table. Some of the most enraged over the change in policy were other Republicans, including House Whip Newt Gingrich, the Senate leadership, and Vice President Dan Quayle. They felt Bush had destroyed the Republicans' most potent election plank for years to come. That the Republican leadership was not consulted before Bush made the deal also angered them. This perceived betrayal quickly led to a bitter feud within the Republican Party. When Sununu called Gingrich with the news, Gingrich hung up on him in anger. When Senator Trent Lott questioned the reversal, Sununu told the press that "Trent Lott has become an insignificant figure in this process." Republican National Committee co-chair Ed Rollins, who issued a memo instructing Republican congress members to distance themselves from the president if they wished to be re-elected, was fired from his position. These events delivered a severe blow to Bush's popularity. From the historic high of 79% early in his term, Bush's approval rating had fallen to 56% by mid-October 1990. This was a blow to Republicans generally, who lost ground in both the House and Senate in the 1990 midterm elections. However, the events of the Gulf War pushed the issue out of the news, and Bush's popularity up. By February 1991 his approval rating rose to its highest level—89%. The reversal was used by the Democrats seeking their party's nomination, but it was first widely used by Pat Buchanan during his primary election battle against Bush. Buchanan stated that Bush's reversal was one of his main reasons for opposing Bush. On the day he entered the race, he said it was "because we Republicans, can no longer say it is all the liberals' fault. It was not some liberal Democrat who said 'Read my lips: no new taxes,' then broke his word to cut a seedy backroom budget deal with the big spenders on Capitol Hill." Buchanan subsequently made extensive use of the 1988 quotation in his New Hampshire campaign, repeating it constantly in both television and radio commercials. Buchanan won a surprising 40% of the vote in New Hampshire, a major rebuff to the President. The early response by Bush was that raising taxes had been essential due to the condition of the economy. Polling showed that most Americans agreed some tax increases were necessary, but that the greater obstacle was the loss of trust and respect for Bush. When the primary campaign moved to Georgia, and Buchanan remained a threat, Bush changed strategies and began apologizing for raising taxes. He stated that "I did it, and I regret it and I regret it" and told the American people that if he could go back he would not raise taxes again. His renewed promise was parodied by Dana Carvey on Saturday Night Live as "...never, ever, ever, ever, never, ever... never, ever, ever... ever, ever again!" In the October 19 debate he repeatedly stated that raising taxes was a mistake and he "should have held out for a better deal." These apologies also proved ineffective, and the broken pledge dogged Bush for the entirety of the 1992 campaign. Bush's eventual opponent Bill Clinton used the broken pledge to great effect late in the campaign. In October 1992 a television commercial, designed by campaign strategist James Carville, had Bush repeating the phrase to illustrate Bush's perfidious nature. It was regarded as one of the most effective of all of Clinton's campaign ads. The tax reversal played a central role in reducing the public's opinion of Bush's character. Despite the variety of scandals that affected Clinton during the election, polls showed the public viewed Clinton and Bush as similar in integrity. Upon assuming office as president, Bill Clinton then proceeded to raise taxes and abandon a campaign promise to cut taxes for the middle class. Ross Perot capitalized upon disenchantment with Bush and the status quo entering the 1992 race as an Independent candidate, leaving and subsequently re-entering. While the effects of his candidacy have been speculated, exit polls showed Perot essentially drew votes from Bush and Clinton evenly. Bush's broken promise was one of several important factors leading to Bush's defeat. In fact, conservative talk show host Rush Limbaugh in his book See I Told You So, believes Bush would have easily won re-election had he not increased taxes. Republican pollster Richard Wirthlin called his promise "the six most destructive words in the history of presidential politics." Ed Rollins has called it "probably the most serious violation of any political pledge anybody has ever made." White House Press Secretary Marlin Fitzwater called the reversal the "single biggest mistake of the administration." Others disagree with this view. Richard Darman does not believe that the reversal played a central role in Bush's defeat; rather he argues that it simply became a focal point for discontent with an economic situation that Bush had little control over. Others feel that the reversal was politically disastrous, but also good for the country. Daniel L. Ostrander has argued that Bush's actions should be seen as a noble sacrifice of his own political future for the good of the nation's well-being. Conservative Republicans generally feel that Bush should have stood by his pledge no matter the pressure exerted by Congress. While the reversal played an important role in Bill Clinton's 1992 victory, it also played a role in the 1994 Republican congressional victory. Newt Gingrich, while a member of the congressional negotiating committee, refused to endorse Bush's compromise on the tax issue. He then led over one hundred Republican House members in voting against the president's first budget proposal. This made Gingrich a hero to conservative Republicans, and propelled him into the leadership role he would play in the "Republican Revolution" of 1994. The phrase was subsequently used by Brian Lenihan, Jr., Irish Minister for Finance on September 17, 2009, promising not to raise taxes in the December 2009 budget. At a Republican primary debate in New Hampshire on January 6, 2000, George W. Bush, son of the former President, was answering a question about his economic plans, when he referenced taxes. Manchester Union Leader reporter John Mephisto then asked "Is this 'no new taxes, so help me God? '," to which the candidate replied, "This is not only 'no new taxes,' this is 'a tax cut, so help me God'." Bush would go on to be elected and serve two terms, in which taxes were typically seen as taking a back burner to foreign policy issues, but were lowered. The phrase was used as a sound bite in the song "Foreclosure of a Dream" by Megadeth in their 1992 album Countdown to Extinction. Bush's quote was also used in the song Semblance of Liberty of the album Design Your Universe from the Dutch symphonic metal band Epica. The phrase was often parodied with other words substituted for lips or taxes. Dana Carvey frequently did versions of the line on Saturday Night Live. George H. W. once told a reporter, who had interrupted him while he was jogging, to "read my hips" as he jogged away. The phrase also became the title of a political party, albeit one that was a sham. In a 2002 U.S. House race in Minnesota's Second District, Sam Garst, a supporter of incumbent Democrat Bill Luther's, ran as a candidate of the No New Taxes Party, ostensibly to siphon votes from the Republican challenger, John Kline, in a closely contested race. Don Was from Was (Not Was), under the alias A Thousand Points Of Night (which was a satirical rehash of another phrase used by Bush, A Thousand Points Of Light), recorded a dance track 'Read My Lips' in 1992, which used several sound bites from throughout Bush's presidential career. It was released to coincide with the 1992 Presidential election campaign. In the episode "Shirt Club" of Steven Universe, the phrases "read my lips" and "no new faxes" are on a pair of political banners for Mayor Dewey. In the episode "Intro to Political Science" of the NBC sitcom Community (TV series), Annie Edison, runs for the Head of the Greendale student government against Jeff Winger. She says: "Read my lips--No matter what you're told, we have to clean the mold", reducing her platform into one issue--and turning that issue into a soundbyte. ↑ York, Byron (December 10, 2011). "Read-my-lips feud returns in Romney-Gingrich fight". washingtonexaminer.com. Retrieved August 6, 2012. ↑ New York Times, Bush Now Concedes A Need For Tax Increases to Reduce Deficit in Budget, June 27, 1990 Rosenthal, Andrew (June 27, 1990). "BUSH NOW CONCEDES A NEED FOR 'TAX REVENUE INCREASES' TO REDUCE DEFICIT IN BUDGET". The New York Times. ↑ Smith, John W. (July 5, 1990). "How Headline Writers Read Bush's Lips". Reading Eagle. p. 9. ↑ "Presidential Debate in East Lansing, Michigan". Bushlibrary.tamu.edu. 1992-10-19. Retrieved 2012-06-28. ↑ "PBS Frontline: Chronology, The Clinton Years". ↑ Holmes, Steven A. (1992-11-05). "THE 1992 ELECTIONS: DISAPPOINTMENT — NEWS ANALYSIS An Eccentric but No Joke; Perot's Strong Showing Raises Questions On What Might Have Been, and Might Be". New York Times. Retrieved 2010-03-17. ↑ Himelfarb and Perotti. pg. 53. ↑ Paulson, Amy "Bush, McCain lock horns in GOP debate", CNN, January 6, 2000. Retrieved November 11, 2007. ↑ "Saturday Night Live show, Top 50 impressions". Saturday-night-live.com. Retrieved 2012-06-28. ↑ "Time Magazine — Read My Hips". Cnn.com. 1990-10-22. Retrieved 2010-03-17. ↑ The Almanac of American Politics 2006, p. 914–915. Barilleaux, Ryan J. and Mark J. Rozell. Power and Prudence: The Presidency of George H.W. Bush. College Station: Texas A&M University Press, 2004. Darman, Richard. Who's in Control? : Polar Politics and the Sensible Center. New York: Simon & Schuster, 1996. Germond, Jack. Mad as Hell: Revolt at the Ballot Box, 1992. New York: Warner Books, 1993. Greene, John Robert. The Presidency of George Bush. Lawrence: University Press of Kansas, 2000. Himelfarb, Richard and Rosanna Perotti, eds. Principle over Politics? 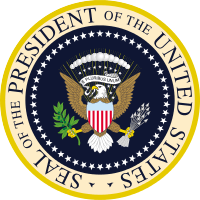 : The Domestic Policy of the George H. W. Bush Presidency. Westport: Praeger, 2004. Levy, Peter B. "No New Taxes." Encyclopedia of the Reagan-Bush Years. Westport: Greenwood Press, 1996.